- Please call our reservation line to book Gulf Splendor I and Gulf Splendor II together! LOCATION: This home is gulf front. 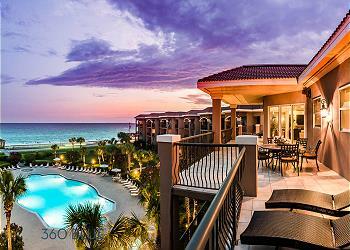 AMENITIES INCLUDE: 4 adult bikes provided, private pool, gulf view. This property comes with 6 dedicated parking spots. Complete Clean Linen Participant - ALL linens, including comforters laundered upon every checkout. We are so delighted that you enjoyed your stay with us in Miramar Beach! We agree that this home is located in a wonderful area close to tons of shopping, restaurants and of course, the beautiful beach! We are also so glad that any issue you had during your stay was resolved quickly and professionally! Thank you for choosing 360 Blue, we hope to see you again soon! The house was perfect! The pillows and blankets on the bed were so comfy. The mattresses were a little hard, though. Yolo coffee was delicious! The alarm to the back pool was very annoying, and we had to have maintenance come as soon as we arrived to change the battery so it would stop beeping. It was an inconvenience, but the service call was quick and easy. The house itself was decorated beautifully and the amenities were perfect. beach access was easy. The pool was perfect for relaxing after a beach day. Overall, it was an excellent stay for 8 women on a bachelorette trip! Thank you!!! I will use this house for my family in the future. We are so glad that you enjoyed your stay with us in Miramar Beach! We agree that this home is perfect for larger groups and we are so glad you decided to stay with 360 Blue for such a fun occasion! We especially loved the photo you shared with us! We hope to be able to host you again soon! What an amazing stay! Thank you for everything. We are so glad that you enjoyed your stay! Thank you for staying with 360 Blue, we look forward to seeing you again soon! Nice house. Overall clean. Pros: Beach accessibility, access to nearby grocery, nice little pool to relax in after a day at the beach, package of Yolo coffee left for us was delicious. Cons:mattresses need to be updated (master bedroom mattress had to roll out of the "hole" to get out of it), would be an easy addition in the master to add some kind of stand/shelf next to the pedastal sink for toiletries, rollers, etc so they don't have to be on the floor. Would definitely return if bedding issues are remedied (see Lauren's review concerning upstairs). We are so delighted that you enjoyed your vacation with us in Miramar Beach! We agree that this home is a great option for a fun beach getaway! We will be sure to share your valuable feedback with our entire team. We hope to see you again soon! Super nice place. Very clean. Downstairs room was a little warm at night but if the air in the main room was set a few degrees cooler and leave the door cracked all was good. The walkway to the beach is super easy. Really enjoyed our stay. We are so thrilled that you and your family enjoyed your vacation with us in Miramar Beach! The photo you shared is absolutely adorable! We hope to host you all again very soon! Loved the house and the view. We agree that this home is amazing and the views are second to none! Thank you for the feedback. Come back and stay with us again soon! What a great photo! We are so thrilled that you enjoyed your stay in this beautiful home. We hope to see you back at the beach soon! Our group of 11 had the best experience here for my sister's Bachelorette party! The location was great for Baytown and was only steps to the beach. The house was so nice and the mini pool was great for a quick dip. I would recommend this house to anyone! Thank you for the memories! What a fun group photo! We are delighted to hear that your group enjoyed your stay with us and could take advantage of the property's proximity to great shops and restaurants! Thank you so much for choosing 360 Blue for such a special trip! We hope to see you all back at the beach soon! We had a great time! The house is awesome. Having the private beach access was totally worth the extra money. The kids loved the pool and how easy it was for them to access the house. Great rental! We are so happy you and your family had such a great stay! Having the private beach access is such a nice bonus! Thank you so much for staying with 360 Blue and we hope to have you back at the beach soon!